When temperatures start the long plunge into winter, a bowl of chili is a comforting and delicious choice for dinner. Students pursuing an online culinary arts certificate can explore a variety of flavor combinations for this classic dish. While the ingredients may differ, each is perfect for sharing on a cold evening. 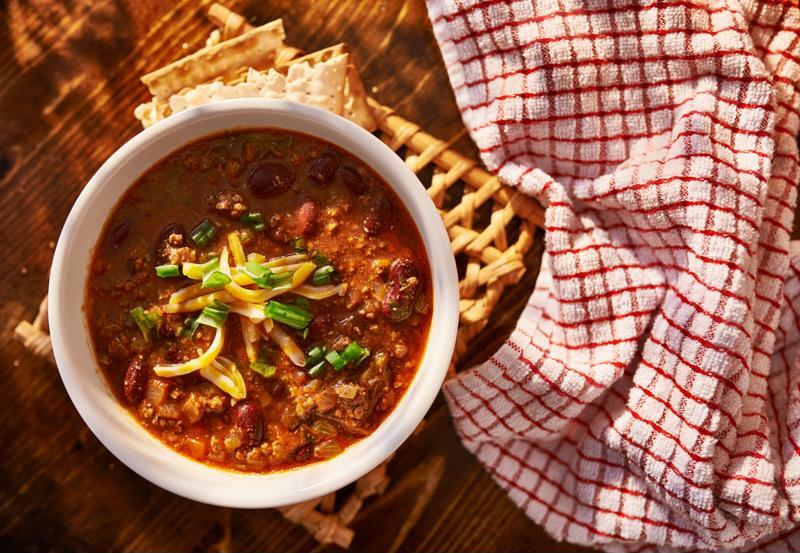 When many people think of chili, they’re craving a flavorful combination of beans, meat and spices. Start making your own by following a straightforward recipe from Ree Drummond. Begin by browning ground beef in a pot with two cloves of garlic. Drain fat from the pot before adding chili powder, canned tomato sauce, oregano, cayenne, cumin and salt. Cover the pot, simmering over a low heat for an hour. Stir occasionally, throwing in water if the chili begins to dry out. Mix masa harina – corn flour – with water and add to the mixture. Then, mix in pinto and kidney beans to cook for another 10 minutes. You can try a variety of tasty ingredients and toppings in your chili. Traditional Texas-style chili involves no beans, instead doubling up on the meat and peppers. The New York Times provided directions that ensure this beanless dish is never short on great taste or texture. Get started by toasting coriander and cumin seeds and grinding them to a powder, using a mortar and pestle. Cut steak into cubes and season with salt before browning in vegetable oil. Drain the meat on paper towels as it finishes, and then place the cumin and coriander powder, plus garlic, onion, jalapenos, masa harina, chili powder and oregano in the pot. Cook for five to 10 minutes before adding the meat back in with a bottle of beer, canned tomatoes, unsweetened chocolate, dried chilies and water. Simmer for about an hour and half, until the beef becomes tender. For something a little different, opt for this version from Martha Stewart featuring white beans and chicken. Cover boneless, skinless thighs with salt and pepper before searing them in olive oil over medium-high heat, cooking for seven to eight minutes. Set the chicken aside, placing onions and poblano chilies in the pot. After cooking on a medium heat for five minutes, mix in garlic, cumin, coriander and chili powder, then canned chilies. Return chicken to the pot to simmer for 15 minutes. Remove the chicken again and add white beans and cornmeal paste to simmer for five minutes. Stir the chicken back in. Chili is a great way for people who are learning to cook to try out different ingredients and explore powerful flavors. Try making a few varieties to discover a new favorite.